I guess everyone approaches a new year differently. A few see it as an opportunity to turn a new leaf and perhaps stop a certain behaviour (such as eating chocolate biscuits etc.) Most treat it as a chance to socialise and party. I probably fall into the first category though rather than turning a new leaf, so to speak, I try to reflect on the past year and choose a significant event, person or thing to inspire me as I cruise through the uncharted waters of the coming year. My inspiration for 2014 comes from a little fellow by the name of Frankie. To understand how Frankie has affected me we need to go back to when he came into our world. Lambing season for us this year commenced at Easter (put whatever interpretation you wish on the timing of this event). We had one lamb born and 100 or so to go. We noticed a second ewe displaying lambing behaviour about mid-afternoon and thought we would have a second lamb that evening or certainly by the morning. The next morning she hadn’t lambed but very agitated, we thought any moment now. By the afternoon when nothing had happened we decided human intervention was necessary and we herded her into a yard to pull the lamb by hand. 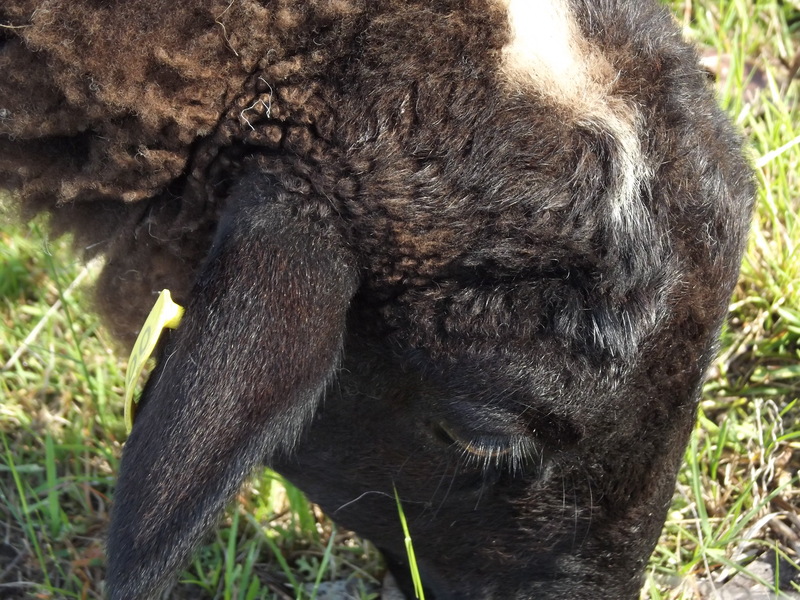 Sounds gruesome but we are experienced at it and sometimes a young ewe needs a helping hand – so to speak. Well try as we may we couldn’t deliver this lamb. Reluctantly we called the vet (remember it was Easter – triple time for a vet! Why do animals always injure themselves or take ill in the middle of the night, weekends or public holidays?). Francis the vet arrived promptly and she got to work. Still no luck. The lamb was twisted and presented upside down. Francis tried everything but to no avail. We were now in desperate territory. The ewe was almost dead and had even given up screaming. We quickly talked options – a caesarean, dismembering the lamb in the uterus or putting the ewe down. Francis had one final trick up her sleeve as obviously we couldn’t just leave a dead lamb inside the ewe. She would try to push the lamb back in as far as she could and then attempt to rotate it. She gave this a shot and got the lamb into a different position. She then placed one foot on either side of the ewe’s rump to brace herself and gave an almighty heave. Like finally cracking the combination of a safe – the lamb came flying out over Frances’ head and clattered into a steel railing fence on the other side of the yard. Next thing she was whirling the little body around by the back legs like a Catherine Wheel. Eventually the lamb coughed and spluttered but was cold as stone. We wrapped it in towels, grabbed a radiator out of storage and desperately tried to warm it. We took shifts with it over the next twelve hours or so. Rubbing it to keep it warm and attempting to feed it a lamb milk formula. Despite all this we honestly felt that each shallow breath it took would be its last. But it made it to the next morning and apart from a major setback about day three when he developed Joint Ill, remarkably little Frankie (no guesses who we named him after) has thrived. But more than that, he has grown into a sheep with personality. As traumatic as his birth was, this event as well as the love and care he received immediately after this has had an indelible effect. How is Frankie different from all our other sheep? the best I can describe it is that he exudes a zest for life. Everything he does is with enthusiasm and vim. It is as if he realises he was dealt a “get out of jail “card and fully appreciates the opportunity. He truly values his life! And it is this vitality and eagerness that rubs off on all who see him. One can’t help but feel joyous after coming into contact with him. Also, as you know sheep, quite famously, are herd animals – not Frankie! He weighs up each situation and makes his own call, irrespective of what the rest are doing. He doesn’t “follow like sheep”. He is his own sheep! So on behalf of Frankie and myself, we wish you a fantastic 2014 – a year in which you live each day to the fullest, light up someone elses life, stand out from the crowd and drop the word impossible from your own vocabulary as well as that of your family, friends and work colleagues.